I have made it so many times since I first posted in in 2012 that I could make these rolls with my eyes closed. These beauties are my go- to for every brunch, weekend away with friends, and pretty much every special occasion. I have adapted this recipe with countless different flavor combos both sweet and savory, but these are the classics. I go weak for a warm, ooey gooey cinnamon roll and gaging from the dozens of batches of these I’ve kneaded, rolled & devoured, most others do too. For those intimidated by yeast-based recipes this one is really quite simple and straightforward. I timed myself making them for this post and they indeed took exactly 90 minutes from start to finish. After just 90 minutes, you’ll pull the most beautiful, golden rolls out of the oven and feel like a bit of a kitchen hero. They are really that good. 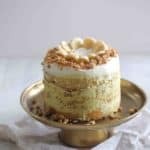 If you are short on 90 minutes and want to make these in advance, I’ve realized that you can indeed make them the night before, store in the fridge, and proof on the counter morning of. I have never frozen the rolls before baking but I have no doubt that would work too. Whether for a special Christmas morning treat or simply something a little extra special for your Sunday brunch, this is a recipe you just must have in your back pocket. I swear every time I have been a houseguest anywhere in the last 4 years I have made these and they are always so appreciated and impressive. Have you ever made this recipe? Do you love it as much as I do? When the dough has just pulled together, turn it out onto a lightly floured surface and knead until smooth, about 5 minutes, or alternately use the dough hook in a stand mixer. When ready, the dough will spring back when lightly pressed. Cover the dough with a damp cloth and let rest on the counter for 10 minutes. Meanwhile, brown your butter by placing it in a small microwave safe glass bowl or container. Cover it with a saucer or other well-fitted cover and microwave for 3-5 minutes. Butter will melt, pop and then turn brown. (you can also do this over the stove-top, but I find the microwave method pretty easy.) While butter cools slightly, mix together brown sugar and cinnamon in a small bowl. On a lightly floured surface, roll out dough into a 12x9 inch rectangle. (use your 9x13 baking dish as a guide.) 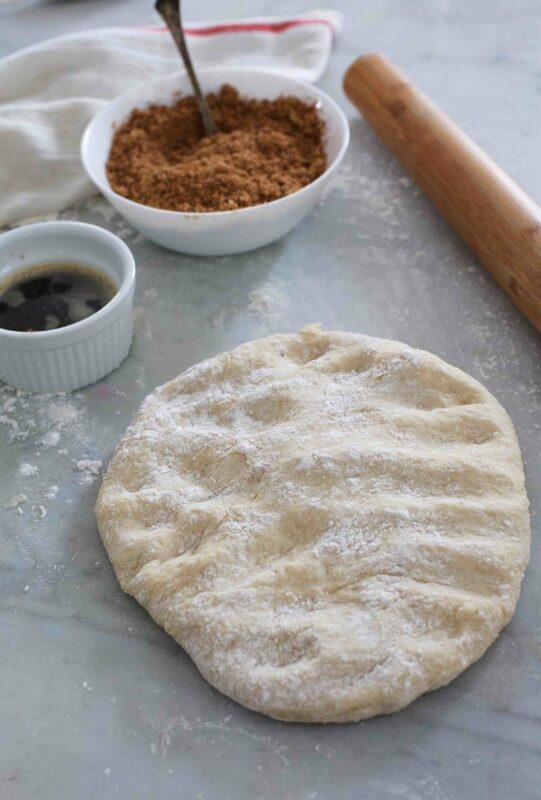 Using a pastry brush- slather the dough with the brown butter. 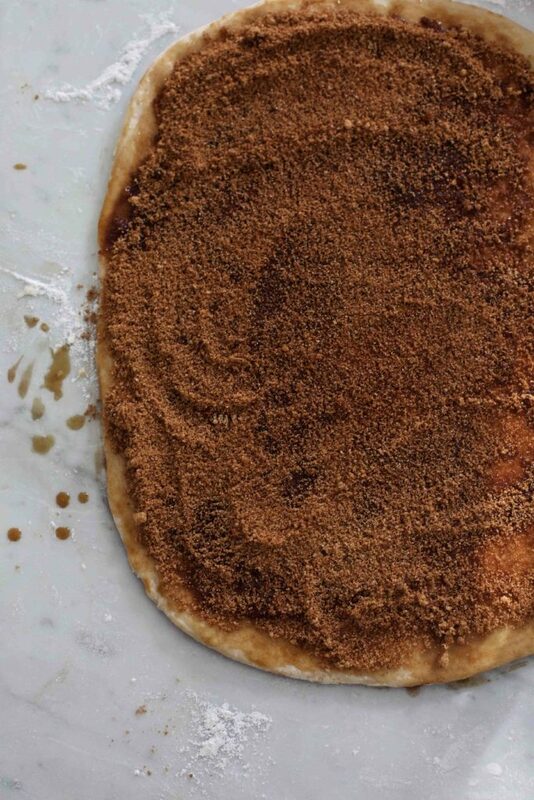 Sprinkle dough with cinnamon sugar mixture and press in lightly so it doesn't fall out when you roll it, getting all the way to the edges. Roll up dough and pinch seam to seal. Using a serrated knife, cut into 12 equal size rolls and place in a 9x13 baking dish. Cover and let the rolls rise in a warm place* until doubled, about 30 minutes. Preheat oven to 375 degrees F (190 degrees C). Bake in the preheated oven for 17-20 minutes, or until golden. 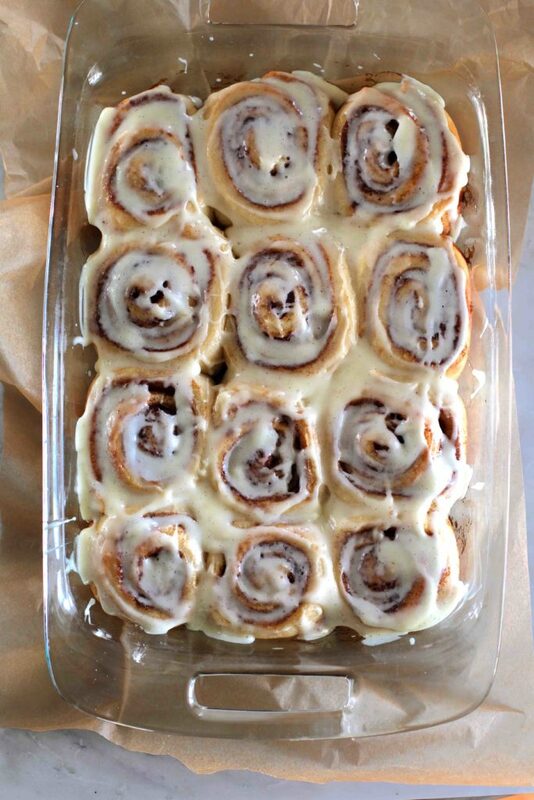 Let cool for about 10 minutes and then spread them with frosting. (directions below) Serve warm. Whip together the softened butter and cream cheese with an electric mixer until smooth and creamy. Add the vanilla and the powdered sugar, 1/2 cup at a time. Beat until creamy and spreadable. *when it's cold in my kitchen, I like to preheat the oven for a few minutes, (usually to about 200F,) and proof them in there. These need to be in my belly. LOVE these!! If you like Cinnamon rolls, why not try the Swedish version too:-) Also not longer than 90 minutes. The Swedish Cinnamon rolls are baked in a very hot oven for a only5-10 minutes. Oh YUM! I loooove cinnamon rolls & easy makes them even better! :) Totally trying these the next time I need a brunch food!! I adore cinnamon rolls and yours look fantastic! 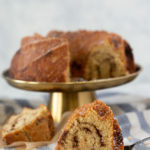 I’ve always had luck with Peter Reinhart’s recipe from the Bread Baker’s Apprentice (with the exception of one batch of sticky buns that just wouldn’t double…my kitchen was that cold that day!) His recipe thankfully doesn’t need to proof overnight. I’d love you to try it out and hear how you think they compare! I’ll have to try out your version this weekend to do a little taste test of my own. 90 minutes? I’m already sold! Thanks for the tip! I will check it out for sure! If it had brown butter it must be good! Oh good lordy. That first picture literally had my mouth watering. 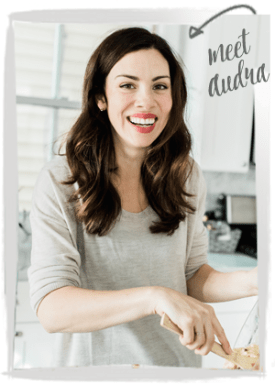 What a fabulous – and relatively easy – recipe, Audra! 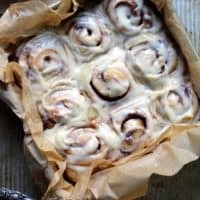 I love nothing more in this world than a gooey cinnamon roll and it looks like you hit the homemade jackpot with these. I hope to try them soon! Gosh, I don’t know how you get that TIGHT spiral in those cinnamon rolls but it’s gorgeous! I still need a lot of work :) Great post! Wow, those look so good! I wish I could have one right now haha. Cinnamon rolls are my life. I love this, Audra, absolutely brilliant! Yesss! This sounds just like my Mom’s recipe. They are soooo good! I am glad you found one to your liking! They were fabulous folks! Thanks Audra. 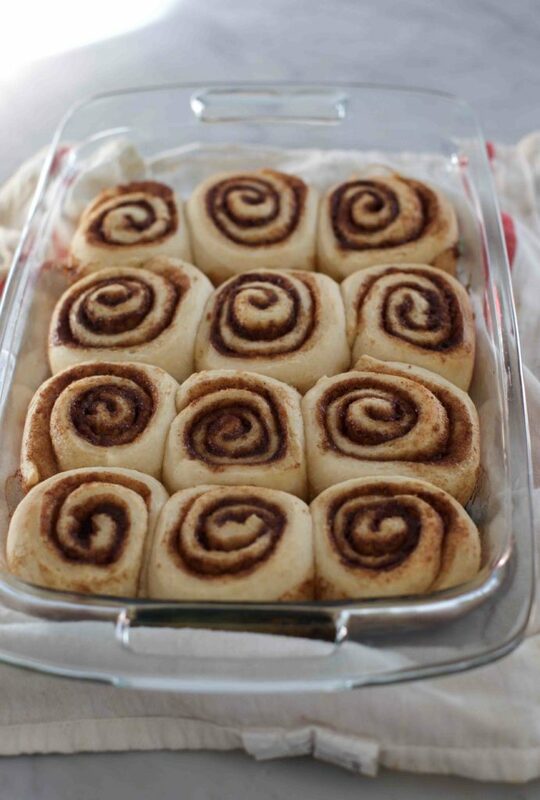 Oh wow, way to make cinnamon rolls even more seductive! ;) Looks like I just want to rip one out of the pan! I love the idea of browned butter in cinnamon rolls. I can imagine how much more flavor an already decadent treat would have that way. YUMMY! I’ve had the same kind of quest and can’t wait to try these! OMG I want to come over for brunch please make these for me! Lauren we could actually do that. Lets have a brunch! We need to get together! i feel the same way! 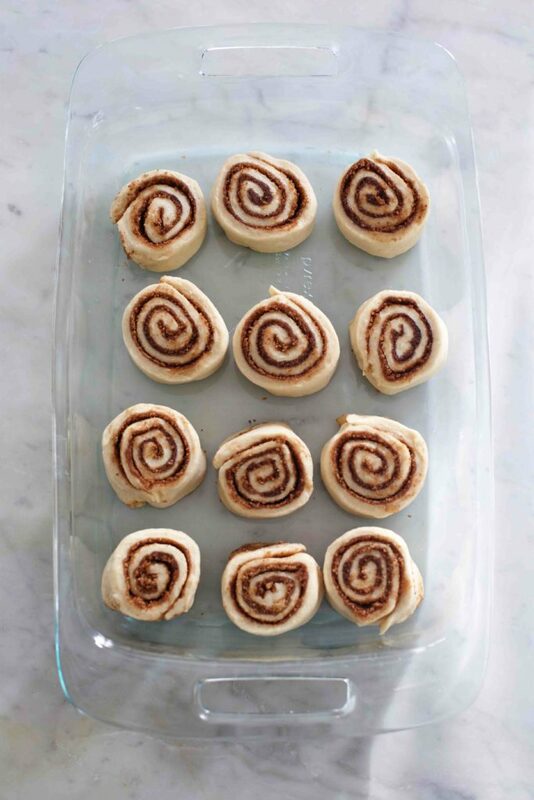 i’ve been wanting to make cinnamon rolls but didn’t want to do all the work, 90 minute cinnamon rolls sound perfect can’t wait to bake these this weekend! I really enjoy that this recipe isn’t a two-day overnight recipe. I made these tonight with the addition of blood orange (heaping T zest in the sugar mixture, 1/3 cup juice in the icing). It makes a pretty pink. They are proofing now. I’ll let you know how they turn out but they smell delicious. I used my stand mixer for the dough with the whisk attachment, switching to the dough hook when adding the last cup of flour. It was perfect. Ooh sounds awesome! Let me know! These sound fabulous – can’t wait to give them a try! I made this recipe on Easter Sunday. I’ve always been intimidated by recipes involving yeast, but I gave it a try. They turned out great! 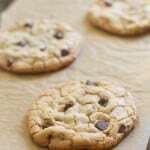 They are fast and easy to make and delicious!!! Thank you for sharing this recipe. I saw you on the Sunday Morning program and checked out your blog–I’ve been hooked ever since! Wow wow wow wow these are AMAZING! I made a batch this week as a gift for our local fire department that had to come to my house for a false alarm. Then I had to make another batch today for my family because they thought their sample was so great from the first batch! I’m wondering now how I could make these to taste like an almond kringle … hmmm … yum! Thanks for the fantastic recipe! I will say I was able to get away with just one batch of the frosting to have enough for two batches of rolls. Making this for Sunday morning with friends that we are staying with. Wondering how you think this would hold up if I made Saturday afternoon but didn’t bake – as i place it in the refrigerator after letting it sit up for the 30 minutes. Or should I just bake them and rewarm them? Any thoughts? Oh my goodness. I made these and they were absolutely amazing. I love cinnamon, sugar, and cream cheese frosting and this just turned out beautifully. Thank you! 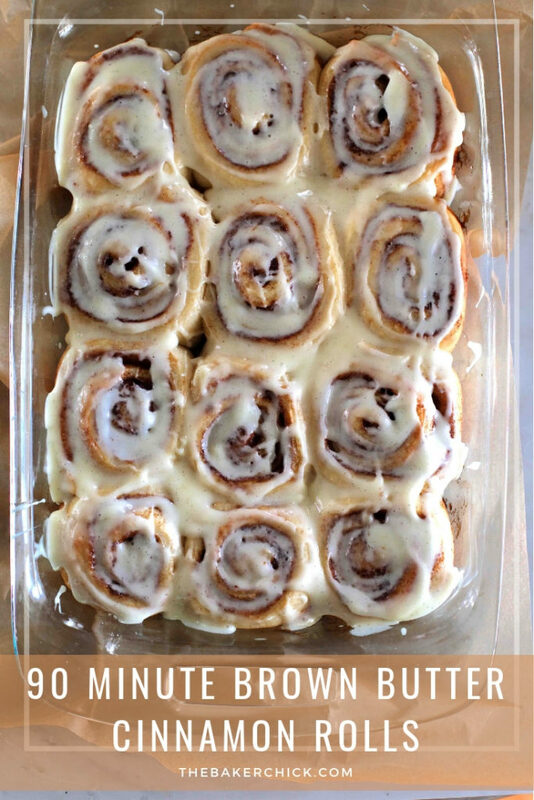 Wondering if you’ve tried making and freezing them…with or without baking first. I made these from AllRecipes without browning the butter but I had to let them rise for about an hour or so until they were doubled. It took a lot longer than 30 minutes. They still came out amazing, though. Also, I used instant yeast, not active dry. What do you think it is? Where did you put the rolls for them to proof? Was it very warm? I find that when I preheat the oven to 200 and then turn it off, it is the perfect place to proof the rolls. They always are huge after 30 minutes! I haven’t Janice, if you try it please let me know how it goes! This recipe inspired me to finally try cinnamon rolls! I just want you to know I was beyond pleased with the results.. These are SO delicious! Would you believe me if I told you this was also the first time I’ve ever tried eating cinnamon rolls?! Thanks for making the experience so sweet! Where’s the recipe for the cinamon rolls? This has the pictures with the recipe for the garlic one. Shoot- not sure how that happened. Let me fix it! 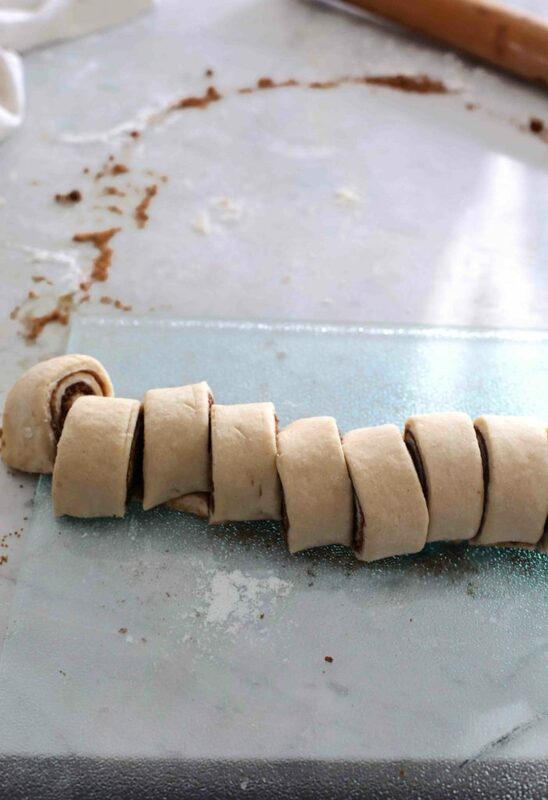 I made these twice now and it is such a great recipe, just a quick question: the second time around my dough was harder to roll out as it kept coming back smaller it wasn’t as easy to manipulate. Can you think of any reason this might be? I have made these several times and they are absolutely amazing. The best was when I made several batches before having my daughter and my parents were able to bring hot cinnamon rolls to the hospital to thank the nurses. Have you ever tried freezing them? I am planning on serving them for a Father’s Day brunch but I will be out of town before hand and will not have time to make them. basic upgrades to receive less damage or deal more damage. X-Men reveals the clash and battle between humans and mutants. ok i have to say after making these from your recipe over a dozen times i was always pushing the time on the proofing bc they just werent puffing up enough…i tried so many different things..but i just went to RE print this and noticed you say INSTANT YEAST! 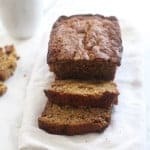 when i had first started making these, i had not realized there were different kinds of yeast, but now that I’ve been baking more yeast breads I actually have both kinds in my cupboard! I am so excited to try this again using instant yeast, as I’m sure it will solve my problem! You might point that out in your description if you think other people might not realize there is a distinction in what yeast to buy. um couple of other things…i need those chocolatey salty cookies in my tummy. and i need to get rid of almond paste. know any nyc bakers who want a mason jar full? I just need the room in my fridge again!!!! :) also my boys SCREAMED when i told them i would make these for the weekend. it is their favorite thing i make. thanks to your recipe. miss you audra!!!!!! 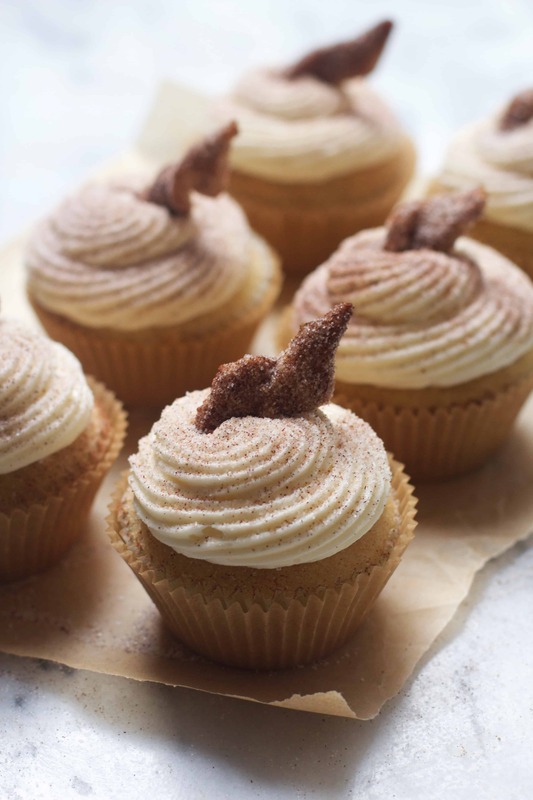 These are our go-to cinnamon buns. Who doesn’t love a fresh, hot cinnamon bun?! 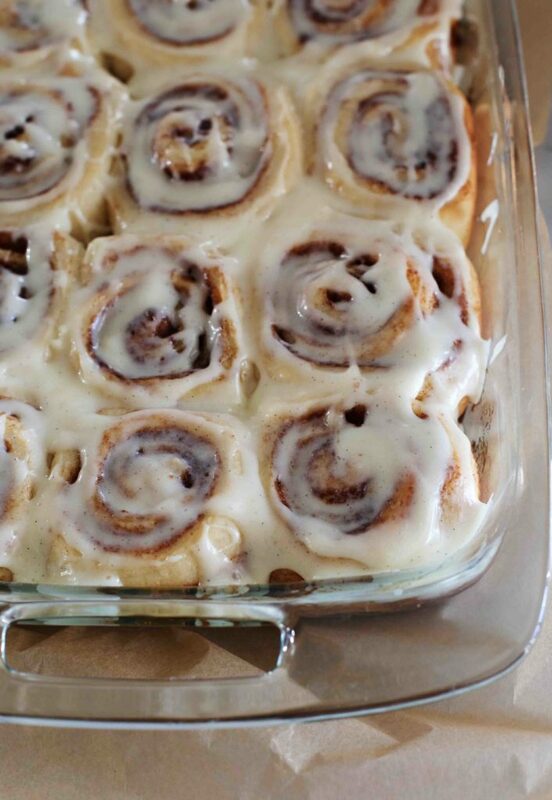 These cinnamon rolls look just irresistible! honestly audra i think i’ve shared your recipe/post on these to so many people and this recipe gets people totally hooked on the baker chick as their go to baking inspiration ha ha ha! 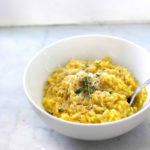 did i miss it or could you tell me what is different about THIS recipe than the original? Just the pix? or did you change something in terms of ingredients? Sorry I read fast…did I miss something? 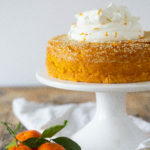 I LOVE THIS RECIPE!!!! Thanks! Hi Audra! I read through the recipe and would just like to double check one thing: the rolls need only to rise once before baking? You didnt let the dough rise before rolling it out? Thanks! Yup- only one proof after forming. The dough does rest for 10 minutes before rolling out but that’s it! I think this will soon be my new favorite cinnamon roll recipe. Pretty hard to top 90 mins., browned butter and a nice fluffy dough. Thanks! ahhh these have been on my must make lost foreverrr! I can’t believe I met you! Your blog is famous! I’ve definitely used one of your recipes for a fall dessert. So crazy! Anyway, Alice’s tea cup has nothin on your baked goods! Much love to you! These have been my go-to cinnamon roll recipe since your first posting of it. They are so good, and so easy! Delicious! I made it for the New Year/my boyfriends bday. We both loved it! Thanks à lot!!!!! I made these Christmas morning! Yum!! I love anything with brown butter and these were great! Although I accidentally overbaked it just slightly, so they weren’t as chewy as I had hoped. And I don’t know if anyone else had this problem- but I seemed to have wayy more butter and cinnamon filling than I could actually put on the dough before rolling it…But otherwise, it was delicious!! Hi. I just made these for mother’s day and they turned out disappointingly sickly sugary sweet. 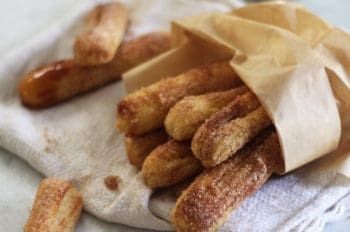 I couldn’t even taste the cinnamon through all that sugar. I thought that maybe there was a typo with the amount of sugar (I’m still hoping that it really is?) in the filling but it’s one whole cup according to other recipes too. I would also add a pinch of salt to the filling to balance it out a bit. The icing was nice though. The dough came out perfect too although I did end up following other instruction when making it. Hey there thought I’d reply bc I make these al the time and love this recipe! How big was your rectangle? I’m thinking that perhaps the dough was not rolled out white big enough making less surface area, so that the sugar cinnamon amount was perhaps thicker? I’m pretty certain it’s not a typo so I’m thinking maybe that’s what happened? I always am able too cut more than a dozen rolls once I roll it all up….how many did you cut? Give it another go and if that doesn’t solve it I guess add less sugar. I have a cheat day coming up from my diet and I think these are going to have to be made for breakfast! Thanks for sharing the recipe! I’ve made these twice now, and they are amazing. My husband is very critical of cinnamon buns, but these were the “perfect amount of fluffy/chewy”. The only thing I changed was browning the butter on the stovetop. I tried it in the microwave in a covered dish, but it still managed to explode and burn! I also added 1/2 tsp of cinnamon to the icing, just for an added kick of cinnamon! My 2 year old likes to bake with me, so I cut off a chunk of dough for him to play with. Rather than waste it, I did a mini roll and placed the cut pieces in a mini-muffin tin and baked for 13 min. They came out so great and I brought them to a play group! Theses Cinnamon Rolls are amazing! I had never made cinnamon rolls before and so these were my first attempt and they were fantastic. 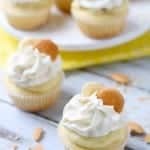 They are so easy to make and they are perfectly soft and sweet. Thank you for the recipe! Oh I love Cinnamon Rolls and will make a batch this weekend. I just used half of my dough to make Sticky Buns. I will be giving half of them away. Wow the amount of icing on these cinnamon rolls is exactly what I like to see!! So yummy, I want one right now! OMG I’ve made this recipe once and I can already see this becoming my go-to recipe :O Absolutely love how easy the dough is to make! Although you said that it’s possible to make them the night before, and then proof them the next day, I was wondering if it was alright to make them SEVERAL nights before. I need to make two batches for a class event, and I’m not sure if I’ll have time the night before, per say. Thanks so much! Hi Ada! You can make them and roll them out, and then cover with airtight plastic wrap and chill until the day of. Then let them proof on your counter (for extra time since they were cold,) and then bake! If it’s more than 2 days early I’d consider freezing them! Next time I plan to decrease the brown sugar in the filling to 3/4 cup since there was at least 1/4 cup leftover after I generously spread it on the rolls. Also, I do not prefer a cream cheese frosting so I mixed together a few tablespoons of melted butter, splash of vanilla, powdered sugar and milk to glazing consistency and poured it on warm for it to soak in. YUM! Do you know of any reason I couldn’t make a double batch of these? I would like more rolls out of my effort if I’m going to mess up my kitchen! (I cook them a little shorter time and freeze them without the frosting for later. Then I warm them up and glaze them). Have you tried doubling the recipe? Do you think it would work with regular yeast if I gave it a longer rise time? I always buy the big container of yeast at Costco – it’s so inexpensive and handy. Instant yeast isn’t something I normally keep in my pantry- and when you get a cinnamon roll craving you need to do something about it!! These look amazing. I love brown butter. Quick question… The recipe says it makes 12, bit your pan only has 9. If I make 12 will they be really small? Thank you very much for sharing this recipe. I was hesitant to try this because of the yeast which means kneading for me. But I was just so glad coz I tried it. It came out fine and yummy. There are some flaws like they were huge and sides were a bit hard. Why is it so? I will definitely try it again. Hubby said it was yummy. If you think they were too big maybe form smaller rolls next time? If the sides were hard I’d guess you over-baked them a bit. Made these this morning. They really are easy and the browned butter makes all of the difference in the world. Mine are no where near as visually attractive as yours, but they were delicious. Thanks for sharing! Omg I really impressed myself making your cinnamon rolls recipe. It was so easy to follow. 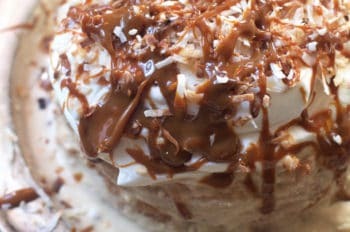 I’m not a baker and I have made plenty of mistakes when it comes to baking, however this recipe turned out really well. And it is definitely better than Cinnabon. 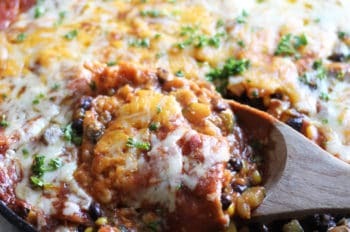 Thank you for sharing this recipe and for my family to enjoy. And I look forward to trying out your other baking recipes as well. Can i make these three days ahead and freeze them? 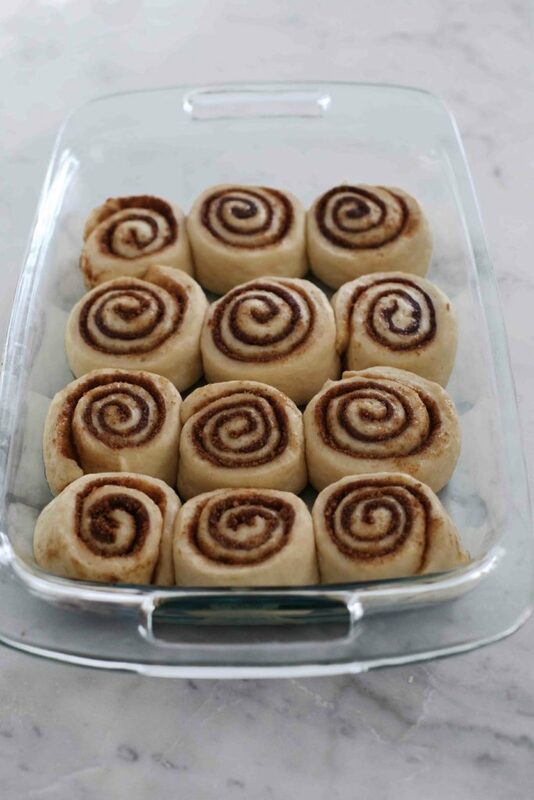 You can make the dough and roll out and then freeze before proofing. Then let them thaw at roomp temp and them proof for a full 45 mins after thawing. These cinnamon rolls are delicious! Turned out amazing and followed the directions exactly! Yummy! My husband and little one approved! Ours came out dry. How do you make them gooey? Just undercook them? Did you try ever before cinnamons rolls with deep frying in oil? Just made these as my first attempt ever at cinnamon rolls. So impressed! They turned out so yummy, and will definitely be using this recipe again!! I only used half the amount of frosting though, as I prefer them better that way.